Despite that only having some changes in background colour, it's actually very hard to read. The odd bit of highlighting is fine, but not if it's most of the code. So I decided to take a more subtle approach. and a cross reference has a term (xrt) and definition (xrd). These are borrowed from how a <dl> works. each xr has a data-index attribute too. which highlights all the xr classes with the same index number. This could be a single bit of code and its explanation, or multiple bits of code cross-referencing to the same explanation. I also add a jQueryUI tool tip to each xrt (the bit in the code), which also pops up with the xrd text in it. I've done this because sometimes the explanations are quite a way further down the page from the code being explained, so it's handy to have the explanation right there. Note I didn't quite get my brain around the options on the my / at settings for the positioning of the tool tip, so I just messed with them enough to display kinda where I wanted them too; away from the code, so one could still read it. These settings might not be the most sensible, but... [shrug]. This is all fairly self-evident. So you'll just have to follow the code examples on a proper computer, sorry. 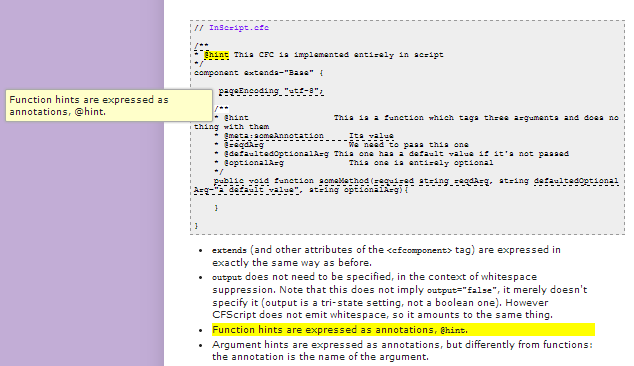 It's a bit of a pain in the next to mark-up the cross references manually, and keep the data-index values sync'ed up. But it works well enough for my purposes. Thoughts / observations / suggested improvements?